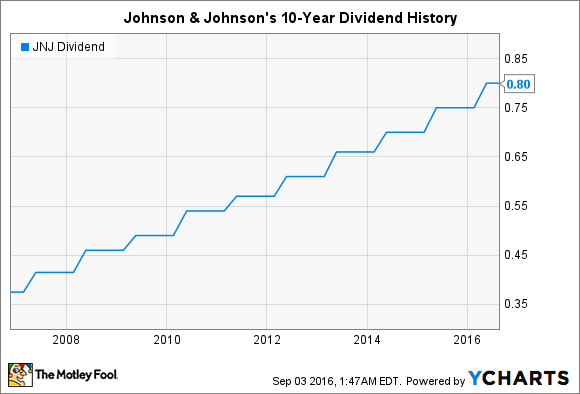 How Sustainable Is Johnson & Johnson’s Dividend? Many investors value the diversified healthcare giant for its healthy dividend yield. But just how safe is the dividend? Johnson & Johnson (NYSE:JNJ) is a global diversified healthcare giant that's well known as the purveyor of such consumer product staples as Band-Aid adhesives and Listerine mouthwash. The company also has the world's most complete medical devices business and the fifth largest pharmaceuticals business. J&J's stock has returned over 150% to its investors over the 10-year period through Sept. 2, significantly beating the S&P 500's 104% return. While its total returns have been healthy, the dividend is a major reason many investors buy this stock. So let's examine how sustainable the dividend seems to be. Data sources: Yahoo! Finance and YCharts. Last increase refers to ex-dividend date. J&J's dividend yield is currently 2.7%, which is down from about 3.1% a year ago. There's a good reason, however, for this decline: The stock price has soared 30% over the past year. For some context, the average yield of the 500 stocks comprising the S&P is about 2%. The stock of Abbott Labs, which makes medical devices and other diversified medical products, yields 2.5%. Pharmaceutical company AbbVie, which spun off from Abbott in 2013, has a 3.6% yield. Johnson & Johnson has long been an innovation juggernaut. Just last year, it announced an ambitious plan to bring to market 10 novel drugs by 2019 that have blockbuster potential, which means they could each generate at least $1 billion in annual sales. Investing in research and development and other resources needed to accomplish such goals, while continuing to form strategic partnerships and make acquisitions doesn't come cheap. Nonetheless, J&J has managed to increase its dividend for 54 consecutive years, while generally maintaining a payout ratio (dividends paid/net income) of less than 50%. As a rule of thumb, a payout ratio of about 60% or less suggests that a company can likely comfortably afford its dividend and that investors can probably expect future dividend increases. Though the payout ratio did spike up briefly in 2012 and 2013 as the company struggled to grow earnings, J&J's current payout ratio of 49.3% gets a clean bill of health. Many dividend analyses stop here, but we're taking this one step forward and looking at the cash dividend payout ratio (dividends paid divided into free cash flow after subtracting preferred dividends, when applicable). This metric provides a more accurate picture of how much a company's dividend policy is costing it than the payout ratio discussed above because dividends are paid in cash, not in net income, which is simply an accounting metric that can be easily manipulated. 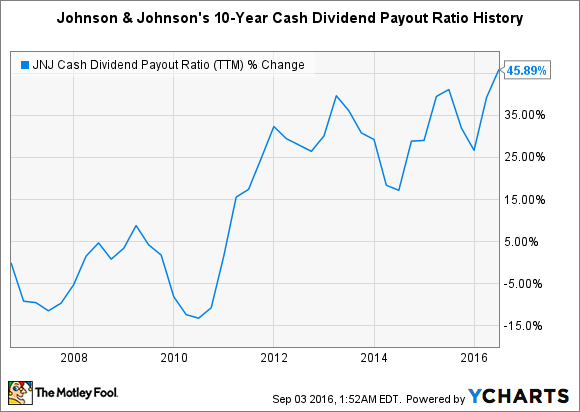 Here's the cash dividend payout picture for Johnson & Johnson over the past 10 years. J&J has paid out about 46% of its free cash flow in dividends over the last year. While this is the company's highest cash dividend payout ratio in the past 10 years, it's well under that 60% threshold. 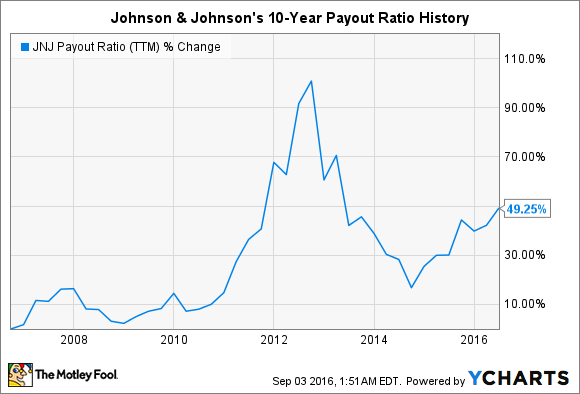 Our analysis indicates there are great reasons that investors have long favored Johnson & Johnson for its dividend. Vital signs indicate the healthcare giant's dividend is not only secure, but also likely to keep increasing.